BJ Coleman (Chattanooga) continued to look like the top quarterback here as he went 10/15 for 170 yards and 1 touchdown on the night. He led two scoring drives in the first half and was the only quarterback to challenge the field beyond the 10-15 yards range for quite some time. He got lucky on one of them but thanks to a great catch and run by Chase Ford (Miami) his stat line reflected how good he looked when he had reps. He threw a couple easy passes but he threw the ball accurately and to the right shoulder on all of them. It’s great to see him put it all together like this but it’s too bad he couldn’t move the East down the field on that last series to make for a really exciting ending! BJ definitely helped himself this week and capped it off with a quality performance. He’s got promising future ahead of him and I still maintain that he has starter upside. Austin Davis (Southern Mississippi) produced a scoring drive late in the 1st half when he threw a short touchdown pass to LaRon Byrd in traffic for a score. Davis made a couple nice throws and threw the ball pretty accurately when he got time to throw. His lack of arm strength was evident on a couple of throws though and they masked that a bit when they rolled him out on a throw to the near sideline to Mayo. He looked pretty comfortable in the pocket at times though. Chandler Harnish (Northern Illinois) didn’t look quite as comfortable though, probably because he seemed to deal with more pressure than any of the other quarterbacks. He took a couple shots, one of them a big one from Akiem Hicks on a screen pass. Harnish was 8/14 for 52 yards and one interception. He also ran for 7 rushing yards and 1 touchdown in the 1st half but at least two of his incompletions were dropped passes by running backs on screens, both of which were set up nicely. Tyler Hansen (Colorado) also got into the game and moved the ball a little bit as he went 12/17 for 144 yards. He didn’t impress me quite as much, but I think he has a chance to get drafted very late or get signed as an undrafted free agent. Dan Persa (Northwestern) was ineffective and got little playing time going 1/3 for only 10 yards and running twice for -2 yards. His two incompletions were significantly overthrown deep balls, and he seemed to believe that he needed to make a big play to stay in the game for more than one or two series. If that’s what he was thinking, then unfortunately he seemed to be right. Tauren Poole (Tennessee) got the running started with a nice run showing his burst and vision on his first carry but didn’t have much room to run the rest of the game and he finished the night with 5 carries for 17 yards with his first run accounting for 15 of those yards. He also added one reception for 14 yards, but dropped a pass on a screen that was sniffed out well by Ronnie Thornton. Marc Tyler (Southern Cal) was another impressive back as he showed impressive vision, a little burst and some power to run through tackles as he gained 34 yards on just 6 carries. Alfred Morris (Florida Atlantic) ended up as the leading rusher for the East with 9 carries for 32 yards. He wasn’t terrific, but he did run through contact very well and a lot of his 32 rushing yards were well earned. Bobby Rainey (Western Kentucky) showed some burst and vision but finished with only 6 receptions for 33 yards. He did, however, catch 4 passes for 23 yards out of the backfield. But the most impressive back on the night as far as statistics were concerned was Lennon Creer (Louisiana Tech). Creer finished with 80 rushing yards on 15 carries and his touchdown late in the 4th quarter gave the West the victory. Creer had some pretty big holes to run through in the second half so I don’t necessarily think he was the best back on the roster, but he sure did have a good game. Tim Benford (Tennessee Tech) had a solid game and caught every pass that I saw thrown his way. He definitely helped himself this week and continued to run good routes tonight. Jarius Wright (Arkansas) may have had the catch of the night on a deep ball from Tyler Hansen that he dove and caught for a 41 yard gain. He displayed his speed and route running all game and ran right by Josh Norman, one of the stars of this week of practice, for that big gain. Lance Lewis (East Carolina) had a solid game catching 4 passes for 41 yards, but a couple of those receptions came on the final drive with less than a minute left. Lewis is still an underrated player but he may not have helped him as much this week as some expected him to. B.J. Cunningham (Michigan State) had a couple receptions and his most impressive play was on a curl that was thrown very well by Coleman and Cunningham was able to catch it and seamlessly turn and run towards the sideline. He ran through a tackle attempt by Rodney McLeod and scored easily. Thomas Mayo (Cal PA) had a solid game with 3 receptions for 41 yards and showed pretty good hands and caught passes in rhythm from the quarterback who delivered the ball to him. LaRon Byrd (Miami) continued to surprised by making a couple tough catches, one on a throw slightly behind him and another in significant traffic for a touchdown in the 1st half. Surprisingly, tight ends led both teams in receiving in this game. Chase Ford (Miami) made one of the great plays of the game by catching a pass in traffic from Coleman downfield, taking a hit from Gideon as he caught the ball and somehow stayed on his feet and rumbled for significant yardage after the catch. It was his only reception, but it was a big one. George Bryan (NC State) had 3 catches for 55 yards but continued to look slow when running routes and when running after the catch. It was hard to see all of the offensive line play from up in the press box, but when I re-watch the game I will definitely have more notes on the offensive line. Kyle Wilber (Wake Forest) had a good game as he was consistently around the ball, he made a number of tackles (unfortunately I couldn’t track down a stat sheet, so at this time I don’t know how many tackles he finished with) and showed his ability to rush the passer. He’s still pretty light to try to stick at defensive end, but I think he has the potential to shift to outside linebacker at the next level. Akiem Hicks (Regina, Canada) didn’t have a lot of impact plays but he consistently showed developing hand usage and his strength to keep blockers off balance. He also had a couple hits on quarterbacks tonight, though he did play too high at times. Nick Jean-Baptiste (Baylor) isn’t fantastic at the point of attack but when you allow him to work down the line of scrimmage and use his motor he can make plays at the line of scrimmage. He had a few tackles at or near the line of scrimmage tonight. DaJohn Harris (Southern Cal) made a nice tackle for loss in this game but I didn’t see a lot of him otherwise. Tyrone Crawford (Boise State) also made a couple nice plays but I didn’t see a ton of him live either. Jerry Franklin (Arkansas), Josh Kaddu (Oregon) and Tank Carder (TCU) all made a couple plays up near the line of scrimmage today and all showed some potential in coverage as well. Shawn Loiseau (Merrimack) had an up and down night but his effort and passion should help him make a roster. I didn’t see too many other linebackers making plays, but again it was hard to keep an eye on everything live from the press box. I didn’t get a great look at all of these guys and because they were playing such vanilla coverages it isn’t the greatest barometer of their ability. I saw Josh Norman (Coastal Carolina) get beat deep and attempt a big hit on Kevin Koger that was rendered ineffective, I saw Aaron Henry (Wisconsin) absolutely level Emil Igweganu over the middle. Other than that I don’t have an abundance of notes on the defensive backs from this game unfortunately. I told you guys that Bryan Anger (California) can punt didn’t I? He had some great punts tonight just like he did all week. He might honestly get drafted. I’m sorry for the lack of notes from the game. I wish I had the stats to help with the defense and it was tough to focus in on everything during the game. It’s always easier to watch the skill position players when the ball is going to them. I’ll re-watch the game at some point and get notes up on it. Thanks for reading all week. I’ll be covering the Senior Bowl next week as well! BJ Coleman (Chattanooga) continued to pace the group, but accuracy was still an issue for him today. I like his intangibles and he is supposed to be a film junkie, so I think that with coaching and patient development he could be a starter in two years. He’s got the arm and the tools, he just needs time. Austin Davis (Southern Mississippi), on the other hand, doesn’t have Coleman’s tools as I have pointed out since my preview and he didn’t have a very good day today. He threw a couple interceptions, missed high at times, and was generally unimpressive. He’s a solid guy but when he’s not accurate as he wasn’t today, especially early in practice, his value plummets. He can stick on a roster and possibly be a Chase Daniel type where he develops in one system and eventually becomes the primary back-up, but I think that’s his ceiling. John Brantley (Florida) continues to have some issues, but he looked more comfortable today and showed the ability to climb the pocket (when it was there) and made a couple nice throws today. He’s a project though and I imagine he will be an undrafted guy that gets a chance to make a roster in camp. Tauren Poole (Tennessee) paced this group for the third day in a row as expected. He continues to show good burst, vision and has run through what contact has been allowed through the first three days of practice. I like him a lot and he is my prediction for offensive MVP in the game on Saturday. I bet a scout one dollar that he would be the MVP, so I’m putting my money where my mouth is. Poole strikes me as a complete back, and I think he will be a steal in the 4th or 5th round. Davin Meggett (Maryland) had a solid day but he still goes East-West more than I would like, and I want to see how he handles contact on Saturday. If he can run through tackles and pick up the tough yards it will help his stock, because from what I’ve seen of him he hasn’t done that. Tim Benford (Tennessee Tech) continues to play well and while he hasn’t dominated like he did on the first day of practice he has been consistently good all week. He can create separation, runs good routes and has caught the ball well overall. He’s definitely helped himself this week. He looks like a 4.5 guy to me, but we will see what he ends up running. Thomas Mayo (Cal PA) came into the week with a lot of hype and to be honest I have been a little underwhelmed. I like what he brings to the table as far as his hands and his ball skills, but his route running needs work and I don’t think he has the speed and burst to create consistent separation in the NFL. He looks like a 4.55+ guy to me. He has shown the ability to make catches in traffic though, so I think he has a chance as an undrafted free agent. I’d be a little surprised if he was drafted based on what I have seen so far this week. Kevin Hardy (Citadel) has good speed and can make good cuts but his hands are very inconsistent. He flashed a nice catch above his head with his hands today, but he body catches consistently and has had issues with drops every day this week. He’s an athletic kid, but his hands limit his upside. B.J. Cunningham (Michigan State) has also had a relatively inconsistent week and I think he will end up a 4th or 5th round pick when all is said and done. He will run in the 4.55 range in my opinion and while he has pretty good short range quickness to create a little separation that way you can tell he doesn’t have great speed when he is running longer routes. He just doesn’t have that extra gear. He’s caught the ball better since the first day but his hands are inconsistent in my opinion. LaRon Byrd (Miami) has looked better the last couple days and has made some catches, but it would be hard to look any worse than he did on the first day when he could barely judge the ball in the air and had a number of drops. He will go undrafted and might get a look in camp because of his size and pedigree at the U, but he won’t make a 53 unless there is a lot of hidden talent that he just hasn’t felt like showing scouts this week. I could see him going to the UFL. A.J. Jenkins (Illinois) has caught the ball much better the last two days which has been nice to see. He’s caught scouts eyes the last couple days especially now that he’s hanging onto the ball, and I still like him as a slot guy in the 4th round range. He could be a nice pick-up for some team there. Chase Ford (Miami) continues to have a strong week and while I don’t think he is much of a blocker he has shown value as a red zone receiver and as a guy who has just enough athleticism to threaten down the seam. He’s just such a big target at 6’6” with 33 inch arms. His hands have above average, and he has helped himself this week as much as any of the tight ends. Evan Rodriguez (Temple) didn’t really stick out to me much today, but he did look better than Emil Igwenagu (Massachusetts) who missed a couple blocks when he was lined up at fullback today. The offensive tackles at the Shrine Game overall are not impressive to me at all. Jeff Adams (Columbia) continues to look the best to me for the East, and while he isn’t great I think he has a shot as a back-up RT in the NFL. At 6’6”, 306 with 34 3/8 inch arms he has tools that scouts can work with. His feet looked better today to me, which has been an issue at times, and he mirrored well in 1 on 1’s. He’s not great, but he’s draftable in my opinion. That’s more than I can say for the other tackles on the East squad. The strength of the East offensive line continues to be the offensive guards. Rishaw Johnson (Cal PA) has raw power and a very explosive initial punch, but I think he struggles to sustain in pass protection and looks heavy footed. He’s big and strong so he has potential, but I think he struggles a bit against speed and his character concerns hurt him. Derek Dennis (Temple) had a solid day and still looks like a guy that will end up as a solid starting guard down the line in his career. He played a bit too high today and has struggled with hand placement this week as he lets his right hand get outside the numbers too often. Desmond Wynn (Rutgers) looks like a possible starting guard to me as well. He’s a 5th round guy right now in my eyes, but he has the size and strength to stick on a roster. He plays too high at times though and that has been his issue all week. If you can correct that I think as he continues to get coached up he could find your way into the starting lineup. Jeremiah Warren (South Florida) had a good day today, his second in a row. I like what I saw from him today and while he doesn’t look like he’s athletic enough to succeed as a puller he drew compliments from scouts today. He does a good job of redirecting, looks strong and when he had good hand placement he could win a 1 on 1 match-up with anyone today. His hand placement could be improved though and he had some trouble moving Travian Robertson off the ball in the run game. I like him though, and I am going to have to go back and do more film study on him. Nick-Jean Baptiste (Baylor) has lost some of the momentum he had in earlier practices. His motor is still there and that is good to see, but his active hands, burst off the snap and size only get him so far. I don’t think he’s going to be an impact pass rusher at the next level, and looks like a guy who could be good in a defensive line rotation at this point. He has helped himself in my eyes though, as he definitely showed some ability to win 1 on 1 match-ups this week. Akiem Hicks (Regina, Canada) continues to show his upside but he is raw and needs patient development. I definitely think he is draftable though. You can’t coach size and power and he has that, just needs refinement from a technique and leverage standpoint. Micanor Regis (Miami) and Kyle Wilber (Wake Forest) have had solid weeks, but both are late round guys at this point. They both have their upside and have flashed in 1 on 1 drills, but Wilber is too light and struggles versus the run against bigger defensive tackles. Regis can beat you with his speed and athleticism off the ball though, and Wilber showed solid moves to beat offensive tackles with today. He uses the same move(s) over and over though, so he is limited in that aspect. Travian Robertson (South Carolina) looked solid again today. I don’t think he’s much of a pass rusher but he is strong and can play the run effectively. He’s hard to move off the ball 1 on 1 and I think he can contribute to a rotation in some way. He’s a late round pick, maybe 6th round, but I think he can make a team. The linebacker group as a whole at the Shrine Game is weak this year, but Brandon Lindsey and Max Gruder (Pittsburgh) are guys that keep sticking out. Lindsey is playing out of position obviously and his upside is at 3-4 outside linebacker, but he has shown some ability in coverage. 4-3 teams should avoid him because he isn’t a good fit at 4-3 DE or at OLB, but he should get grades in the 4th round range from 3-4 teams. Shawn Losieu (Merrimack) isn’t an overly impressive kid, but he’s a high effort guy and I have a feeling he will end up making a squad as an undrafted free agent. He strikes me as a guy who will be a valuable special teamer during his career even if he never works his way into the starting lineup. Josh Linam (Central Florida) had an interception on a bad throw from Austin Davis today, but overall I don’t have draftable grades on him, Najee Goode (West Virginia), Steve Erzinger (Army) or Nick Sukay from Penn State. Josh Norman (Coastal Carolina) set the curve for the defensive backs again today. I only saw two of his interceptions, but I heard that he ended up with three. He continues to show good ball skills and athleticism. He showboated quite a bit today which you’d think he wouldn’t need to do since he should be up to 6 interceptions on the week by my count, but the scouts I was around weren’t too impressed by that. They were impressed by his closing speed and his athletic ability though, and he has definitely helped himself as much as anyone at the Shrine Game this week. Micah Pellerin (Hampton) had a couple nice plays today as well, but he doesn’t look very physical and I am interested to see how he supports the run and tackles in the game. From what I’m hearing about him from scouts I’m not expecting much from him as a tackler. R.J. Blanton (Notre Dame) had his best day so far as he looked good in press-man coverage. His size and solid arm length help him in those situations, and he showed his value there. He has struggled in off-man this week, but when he can get physical he has value. BJ Coleman (Chattanooga) looked pretty good as usual. His accuracy is still not where I would like it to be, but he continues to look like the best quarterback at the Shrine Game. He threw well on the move today from what I saw but still seems to be working on his footwork. He drives the ball well though, and just needs coaching and I think his accuracy will improve. He was less erratic today, so hopefully he continues to improve over the course of the week. I haven’t seen him make very good reads so far this week either and he should have thrown a pick today, but he has the intangibles and is reportedly a huge film junkie so I don’t think that will be an issue down the line. He’s a developmental guy with impressive intangibles from what I have been able to find out about him, but he will need time once he gets to the NFL. Give him a couple years though and I think he can be a starter. Austin Davis (Southern Mississippi) looked better today, but I think playing next to Brantley helps that a bit. I’d say that Davis is probably the third best quarterback here behind Coleman and Chandler Harnish, but that’s my personal opinion. Davis is a late round guy in my eyes and I don’t think that will change much this week. He’s got intangibles and a solid arm so I think he has the potential to stick somewhere as a back-up. I don’t think he has much starter upside at all, which means he’s a 6th/7th round guy or maybe an undrafted free agent. His ball velocity is noticeably less than Coleman’s and he doesn’t have great size or athleticism. He’s solid in many areas but spectacular in none, but you know what you are getting with him. There just isn’t that much upside to his game though. John Brantley (Florida) is probably going to go undrafted to be honest. He has more upside than Davis because he’s not a finished product and isn’t as polished, but his mechanics are a pretty obvious issue. Like Davis he projects to be a back-up in the NFL but unlike Davis he isn’t ready to stick as a #3 right away and compete for a roster spot. The future doesn’t look too bright for Brantley and even if he continues to improve during the week I don’t see it helping his stock much. He’s been kind of an afterthought with the scouts I have been around, though he did look a little more comfortable today. Tauren Poole (Tennessee) continues to impress and I still think he’s the best back here. He’s not going to walk into the NFL and start as a couple scouts have pointed out for the past two days, but I do think he can contribute immediately. He’s not going to rip off huge chunks of yardage and make the big highlight runs, but I think he will be a reliable back in the NFL. He strikes me as a nice 4th or 5th round pick-up that will make the team and contribute more than people expected coming in. He’s my early favorite for the Offensive MVP of the game on Saturday. Davin Meggett from Maryland and Alfred Morris from Florida Atlantic haven’t impressed me much. Meggett has shown some ability to make cuts as has Morris, but I think the game will be important to evaluate both of them. Meggett is a quality physical specimen that should be better than he actually is at running through contact, and Morris is more of a physical type runner than a quick/burst type of runner. Both have late round/UDFA grades from me right now, but I’ll see how they look the rest of the week. Tim Benford (Tennessee Tech) continues to look good as a route runner and he continued to create separation again today. He had a couple drops early in practice but overall he had a good day and has probably had the strongest start to the week of any receiver here outside of Devon Wylie. He’s got good hands and he can catch passes outside of his frame which I really like, but I don’t think he’s going to be much of a yards after catch guy at the next level. But if he can create separation and catch the ball consistently like he has so far this week he should be able to get drafted and make a roster. Unlike yesterday A.J. Jenkins (Illinois) looked much better today catching the ball. He didn’t look like himself to me yesterday as a route runner or as a pass catcher, but today he looked more comfortable and caught the ball much better which was good to see. One scout that was near me was very high on him, thought he was the fastest guy of the group of East WR’s. I’m not sure I agree with that because I think Hardy could run faster than him, but Jenkins does have some speed and pretty good hands. I have been high on him for a long time, so it was good to see him bounce back strong. I didn’t see too much from receivers other than that, though Lance Lewis (East Carolina) and Thomas Mayo (Cal PA) did continue to demonstrate pretty good hands. Lewis looks like a pretty good athlete and I like him as a 5th/6th round sleeper at receiver. Mayo still looked slow to me today and is clearly very raw as a route runner, but he has pretty reliable hands. Kevin Hardy (Citadel) and LaRon Byrd (Miami) continue to disappoint. Hardy can at least run and get open but his hands are as inconsistent as any receiver at the Shrine Game. He body catches often when he does make the reception, but more often than any receiver here he has dropped passes. Jenkins seemed to give him a run for his money on the first day, but he definitely has the most drops of anyone that I have seen so far. One other guy I anticipated having hands issues was B.J. Cunningham (Michigan State) and he has shown his inconsistency so far as he has struggled to catch the ball consistently. He had a better day today from what I saw as he was generating more separation and catching the ball cleanly. There are times when he looks like he could be a quality NFL receiver when he catches the ball cleanly, but more than anything I think Cunningham is inconsistent. He should get drafted in the 4th-6th round range but I’m not sure he will ever be a NFL starter. Chase Ford (Miami) continues to impress which definitely took me by surprise. He continues to show pretty good hands and he made a very nice catch off of a tipped ball. At 6’6” with 33 inch arms he presents a big target for quarterbacks to throw to. He may be playing himself into the NFL Draft this week, he even impressed as a blocker at times today. He seems to have taken over the top TE spot for the East as the scouts around me weren’t very taken with Evan Rodriguez (Temple) today. He’s a smaller guy at 6’1.5”, 242 pounds with only 31 5/8 inch arms, so length can be an issue at times. He looked pretty good when he was lined up at fullback today and could be a FB/H-Back type prospect in the NFL. Not sure if he’s built to consistently line up as a NFL tight end, and may not have the speed to threaten down the seam if he is split out, but he is solid. Derek Dennis (Temple) and Desmond Wynn (Rutgers) continue to impress me, though again it was largely in 1 on 1 drills. Both had their ups and downs today and neither are perfect prospects, but I think they can both be solid NFL starters given coaching and development. Dennis seemed to struggle with speed off the ball at times as Micanor Regis was able to beat him off the ball due to his burst and athleticism off the line (plus a nice swim move). However, he did a pretty good job against Jean-Baptiste, a guy who has been very tough to block 1 on 1 this week. Desmond Wynn still plays a bit high and his technique isn’t very well refined but he has good size and when he matched up well with Akiem Hicks today. None of the offensive tackles are very impressive in my book, though I think Jeff Adams (Columbia) has the best chance to be drafted of any of the East tackles. He doesn’t have good feet and will have to try to stick as a tackle on the right side in the NFL, but he showed some push in the run game and looked better in pass protection that the other tackles. You can tell he has long arms as he was able to use them to his advantage to slow defensive ends down in 1 on 1 drills. Joe Long (Wayne State) has the size and length to engulf smaller rushers like Jabaree Tuani at times, but he leans a lot and doesn’t have good balance in my opinion. Quentin Saulsberry (Mississippi State) continued to have a solid week of practice. He’s not a stud and he doesn’t do great when matched up 1 on 1 with a defensive tackle like Jean-Baptiste, but I think he has the potential to be a solid starting center in the NFL. He won’t be able to drive block defensive tackles which can be so valuable in a center, but he can be a reliable player for you. I still am not very high on Rishaw Johnson (Cal PA), though he does have NFL size and can get a quality push in the running game. He has some character question marks which could scare some teams off, but he has upside. Nick Jean-Baptiste (Baylor) and Akiem Hicks (Regina, Canada) both continued to impress me at defensive tackle today. NJB drew double teams constantly in team drills and continued to prove very difficult to block in 1 on 1 drills. He didn’t always dominate his man and he ended up on the ground a time or two, but he definitely looks like a high effort guy that has demonstrated a quality motor so far this week. He has very active hands plus he is powerful. He didn’t stand up to double teams quite as well as I would have liked today, but he did a pretty good job. Hicks continues to struggle to play with good leverage as he stands up and gets too high after he comes out of his stance. If he can be coached to play with better pad level to avoid giving up leverage he could be quite a talent. He looks strong in his lower body and has plenty of power there. He’s raw and needs development but there is undoubtedly potential there. I liked what I saw from Travian Robertson (South Carolina) today as well. He looked good in 1 on 1 drills and in team drills. He seems fundamentally sound and played with good leverage consistently. This was particularly evident when he and Hicks would go one after another in 1 on 1 drills. Micanor Regis (Miami) also showed some ability since he has burst off the snap and can beat you with an initial move if you aren’t ready for him. He’s not much more than a rotational guy in the NFL and is a fringe draft prospect at this point. Kyle Wilber (Wake Forest) and Matt Conrath (Virginia) didn’t have very good days today. Wilber, as I expected, didn’t hold up very well in the run game thanks to his thin lower body and light frame. He also struggled to win match-ups 1 on 1 in drills as his moves looked slow. Conrath also looked slow off the edge but that’s not surprising. He needs to bulk up and play 3-4 defensive end. Brandon Lindsey (Pittsbugh) and Max Gruder (Pittsburgh) both looked good to me today. Lindsey is showing some ability to drop into coverage which is impressive for a guy who has played a lot of defensive end in the past two seasons. Gruder continues to play instinctual football and while he isn’t that strong he is fundamentally sound and reliable. He will get drafted and play special teams and work his way up as a reserve. Lindsey’s value is really as a pass rusher, but I don’t think there’s much question he has it in him to play there now that he has shown he can drop into coverage. He’s helped himself this week even if he hasn’t made a lot of splash plays. Shawn Loiseau (Merrimack College) looked good today as well. He seems to be the leader of the defense which speaks to quality intangibles and he seems to be pretty athletic. I don’t have a draftable grade on him yet, but if he has a strong rest of the week he could draw some attention as a UDFA. Josh Norman (Coastal Carolina) continues to impress, and he even remembered his own helmet today! He continues to display quality ball skills, impressive closing speed and he was ready to lay a couple people out today. He closed like a heat-seeking missile a couple times, so look for him to hit someone HARD on Saturday. Micah Pellerin (Hampton) and Norman were the two names scouts seemed to think were the best defensive backs on the East roster. I tend to agree, though I’m not as high on Pellerin as some. He’s athletic though, so he has some upside. He’s a fluid athlete who looks good in drills but haven’t been as impressed with him in coverage. None of the other corners impressed me much today, and I think it’s clear Norman has separated himself a bit from the pack. Matt Daniels (Duke) continued to struggle in man coverage today though he did have a nice hit on Chase Ford after he made a nice catch over the middle. Problem was, they weren’t supposed to be hitting. Jerrell Young (South Florida) looked good in drills and seems to be athletic, but he got burned on day one in coverage and I didn’t see him much today. I’ll be keeping an eye on him. BJ Coleman, QB, Chattanooga: Coleman was far and away the best quarterback on the East roster and was in my opinion the best quarterback of both practices. He measured in at 6’3”, 234 pounds and had huge 10 ¼ inch hands (this was apparent when I shook his hand when I chatted with him after practice, he has a very strong handshake). His arm strength was apparent from the first throw he made and his passes cut right through the wind. His mechanics looked good as he has a compact, over the top delivery. The ball really shoots off of his hand and he has a quick release. He threw a couple nice deep balls today and demonstrated quality play fakes which I like to see. His accuracy was a bit erratic at times so he has room to improve from an accuracy perspective, but he easily has the best arm in St. Petersburg. He did have a couple wobbly throws during practice and that is something I noticed when I watched film of him, so that’s something I will be keeping a close eye on. I’ll have an interview with BJ up later in the week, so look out for that! Austin Davis, QB, Southern Mississippi: Davis was probably the second best quarterback on the East today. He doesn’t have as strong of an arm as Coleman or John Brantley, but he still made some impressive throws over the middle and had a nice deep ball one play after Coleman’s beautiful deep ball early in practice. You couldn’t tell the difference between who threw the ball if you only saw the ball, which is a plus for Davis. Davis’ height will make it hard to boost his stock since he measured in at just over 6’1”, 218 pounds. He isn’t the most physically impressive quarterback, but a couple times after a play I saw him pull a receiver aside and talk with him. That definitely impressed me, and it gave me a sense for the intangible qualities I’ve heard he has. It’ll be interesting to see how he does the rest of the week, but he’s never going to throw great passes from the far hash to the opposite sideline, he just doesn’t have that kind of arm strength. I’m not sure he has upside as a starter like Coleman does, but I do think he has the potential to stick on a roster and develop as a back-up. John Brantley, QB, Florida: Brantley definitely has a strong arm but from the first throw he made you could see the hitch in his throwing motion. His mechanics definitely need work because his throwing motion dips down which elongates it. He has the arm strength to mask it a bit, but his mechanical flaws were obvious when he was alternating snaps with BJ Coleman early in practice. His arm strength was apparent, but his accuracy was inconsistent. Here’s hoping he picks it up the rest of the week because he left something to be desired today. Tauren Poole, RB, Tennessee: Poole is the top running back in St. Petersburg in my opinion. It’s not easy to evaluate running backs when everyone is in shells and no one can tackle, but Poole displayed quality burst to hit the hole today. Obviously it will be easier to see more when they have pads on the rest of the week, so I will definitely have my eyes on Poole tomorrow. He may not go higher than round 4 or so but I think he can contribute to a NFL team as a rookie at running back. I’ll have an interview with Tauren later this week as well, so keep an eye out for that. Tim Benford, WR, Tennessee Tech: Benford was the best receiver on the East roster today without question in my opinion. I was consistently impressed with him and three different scouts I talked to liked what they saw from him as well. He created very consistent separation, was regularly targeted and had only one drop near the end of practice. Otherwise he was catching everything with his hands whether it was inside or outside of his frame. He seemed to be running crisp routes and showed some physicality and toughness which I liked. He absolutely ran over Jerrell Young on one play when Young got in his way on his route, and after he beat another defender for a catch in traffic he bumped him as he finished the rep. I really like this kid and I can’t wait to see how he looks the rest of the week. I will have an interview with Tim later this week as well. Thomas Mayo, WR, California (PA): Mayo has been getting some hype as a small-school receiver and he definitely lived up to some of it today. He displayed impressive hands as he made a couple nice snags outside of his frame today. One scout I talked to said that when he worked him out he thought he had some concentration issues that led to drops, but that didn’t look like an issue today. It’s something I will be looking for the rest of the week though. I thought he looked a bit slow when he was running his routes though and he does need coaching up with his route running, but I think he has more straight line speed than quickness and burst. It will be interesting to see if that hypothesis holds up this week, but I did like some of what I saw from Mayo today. A.J. Jenkins, WR, Illinois: Jenkins is a guy that I have been high on for a long time and I even had him on my list of potential break-out players before the season started. He had a good season like I expected, but he did not have a good day today. He had way too many drops, at least four if I remember correctly, and while he showed the ability to create separation and to beat guys deep he didn’t finish the play with a reception. That really disappointed me, and I’m hoping that since he was a relatively late addition to the game that he just had an off day. I have high expectations for him the rest of the week, but today was not a good start for him at all. Lance Lewis, WR, East Carolina: Lewis didn’t stick out to me much today, but on a couple plays he did demonstrate solid athleticism and hands. He looked passes into his hands well, but early on in practice he seemed a little bit nervous. Maybe that’s just my interpretation, but regardless I expect him to be more involved in the next three days of practice than he seemed to be today. He’s got draftable ability despite measuring in smaller than his previously listed 6’3” height. B.J. Cunningham, WR, Michigan State: Cunningham started off the practice great today making catches on passes outside of his frame and looking like a polished receiver ready for the next level. But as practice progressed and he started going up against defenders he struggled to separate from some of the athletic defensive backs and showcased his inconsistent hands by dropping a number of passes. I was frankly surprised how well he was catching the ball early on in practice because I always questioned his hands when I watched film of him. He definitely lived up to that billing though, but it’s tough to figure out if his hands aren’t that good, if he has concentration issues or if it’s a mixture of both. I’ll keep track of it the rest of the week and post my thoughts on it. Kevin Hardy, WR, Citadel: Hardy definitely has some athleticism and he showed quality speed and burst when he was running routes. His hands were inconsistent as well and definitely dropped some passes early on in practice. This same thing happened with Perry Baker last year and he recovered well and had a great rest of the week, so hopefully Hardy can do the same. LaRon Byrd, WR, Miami: This may be one of the last times I give Byrd much mention in my notes because as expected I don’t think he will be drafted. He looked slow today, showed little to no burst or suddenness in his route running, and had as many dropped passes as anyone if not the most of any receiver all day. He’s an undrafted guy for sure and I’m not sure he will even get practice squad looks. Evan Rodriguez, TE, Temple: Rodriguez looked like the best tight end on the East roster today. He showed good burst and speed to threaten down the seam and absolutely burned Jerrell Young down the seam as he used good suddenness in his route to catch him flat footed and literally fly right by him. Young recovered though and managed to get up and deflect the pass which was lucky for him because Rodriguez was 5+ yards away from him down the field. Regardless, Rodriguez impressed me today and I will definitely be paying more attention to him as a blocker the rest of the week. Chase Ford, TE, Miami: I did not have a lot of praise for Ford in my preview for this game but I have to admit he looked pretty good today. He isn’t a great in-line blocker and that showed today, but he made a number of nice catches outside of his frame and showed quality hands. I don’t know that he will be able to threaten much down the seam, but he made a couple nice catches in traffic today which helps him. He’s still an undrafted guy in my book, but he helped himself today. Derek Dennis, OG, Temple: Dennis may have been the most impressive offensive lineman today in my opinion. I didn’t spend a lot of time watching the offensive line today, but every time I watched him he played with good pad level, bent at the knees, showed good hand placement and balance. I didn’t see him match up with Nick Jean-Baptiste at all, but that is a match-up I can’t WAIT to watch the rest of the week. Desmond Wynn, OT, Rutgers: Wynn was listed as an OG by the Shrine Game roster but I think he has a chance to stick as a RT or as a guard. He measured in at 6’5”, 305 pounds today with 34 inch arms and 10 inch hands. He definitely started the day out right at the weigh in and continued his strong day in practice. Wynn was one of the only guys I saw slow down Akiem Hicks today and if he can work on his pad level a bit I think he has a future as a starter on the offensive line. Rishaw Johnson, OG, California (PA): Johnson was getting some hype coming into the day but I wasn’t very impressed, particularly in the run game. He did a better job in 1 on 1’s in pass protection, but looked slow and heavy footed in the run game. I didn’t get many notes on the offensive tackles today, but overall I was not impressed with them as a group. They did a good job in 1 on 1’s against guys like Julian Miller and Jabaree Tuani, but struggled against guys like Kyle Wilber and Micanor Regis. I don’t think this OT class is particularly strong, but it was only the first day. I’ll definitely have more notes on the offensive line the rest of the week. Quentin Saulsberry, C, Mississippi State: Saulsberry doesn’t look like a dominant center but he looks like a well-rounded player who looked good in 1 on 1’s. This may just have been because his teammate Tyler Horn looked completely overmatched and didn’t look draftable today, particularly in 1 on 1’s. I’m excited to see him the rest of the week. Nick Jean-Baptiste, DT, Baylor: All I can say is WOW. NJB as he will be referred to in the rest of my notes was fantastic in 1 on 1’s today. I didn’t pay attention to him in the team drills, but believe me I will be the rest of the week. I had concerns about him holding up versus the run and those concerns have not yet been dissuaded, but NJB looked like BJ Raji in 1 on 1’s. He is a shorter defensive tackle as he measured in at just under 6’2”, 335 pounds much like Raji is and his frame reminds me of Raji’s as well. That’s not to say NJB will end up in the top 10, but the comparison popped into my head today when I was watching him. He showed good burst off the snap, very active, strong and powerful hands and was essentially unblockable. Even when an offensive lineman was in good position and mirrored him he continued fighting thanks to an impressive motor (at least in this drill) and usually ended up winning the drill. I was very impressed and he looked like the #1 DT on either roster based on what I saw from him today. I can’t wait to see what he brings to the table the rest of the week, but I hope he does this well in team drills particularly versus the run. Akiem Hicks, DT, Regina (Canada): Like NJB I mostly saw Hicks in 1 on 1’s but he impressed me there as well. He was solid off the ball, showed active hands and quality bend and hip flexibility which was very nice to see. I was told to watch out for him this week and I definitely see some of what I was told to watch for. He’s got a ways to go as far as technique but the effort seemed to be there. While his hands were active they weren’t always effective and his pad level was inconsistent. When he got his pads low though he showed an effective bull rush which was definitely encouraging. He needs coaching, but the kid has upside without a doubt. He definitely won the weigh-in if that counts for anything since he measured in at 6’4.5”, 324 pounds with 35 1/8 inch arms and 10 1/8 inch hands. Matt Conrath, DE, Virginia: Conrath predictably looked slow off the edge today and gave credence to the people who have been projecting him inside to defensive tackle. But he measured in at 6’7”, 281 pounds so I don’t think that is his best position despite what others might think. I think he should continue to bulk up and get stronger and attempt to play 3-4 defensive end where his edge speed wouldn’t be as much of an issue and his height and frame would be a huge plus. He has upside but it isn’t as a 4-3 defensive end which is where he is playing this week. That’s unfortunate for him, but hopefully he can demonstrate his value despite playing out of position today. Kyle Wilber, DE, Wake Forest: Wilber looks just as skinny in person as he does in film and his legs in particular looked very lean which is concerning, but he looked like a natural in 1 on 1’s. He demonstrated quality hand usage and looked smooth using his hands and pass rush moves to beat seemingly overmatched offensive tackles. He won’t hold up well in the run game because of his lack of size and strength, but he is a possible OLB convert thanks to some of his pass rush potential. He didn’t have a big year rushing the passer like I thought he might, but I am really excited to see what he does the rest of the week. Micanor Regis, DT, Miami: Regis had a couple nice plays today and looked solid in 1 on 1’s. He had a couple impressive bull rushes where he decimated the offensive lineman he was going up against but he was also swallowed up at times. He’s got upside and I think he has some draftable ability so I will be watching him the rest of the week, but I don’t think he helped himself too much today. Julian Miller, DE, West Virginia: Miller didn’t impress me much today and looked unspectacular in 1 on 1 drills. He didn’t create much push and didn’t show much edge speed either. He is either a versatile player or a ‘tweener, and right now it looks more like the latter unfortunately. Brandon Lindsey, OLB, Pittsburgh: Lindsey started his full-time transition to linebacker today and from what I saw it went pretty well. I am very interested to see how he does in coverage the rest of the week but the little I saw of him today was positive. It’s not easy to transition from a down lineman to outside linebacker so I expect some significant growing pains at some point, but I expect he will demonstrate his upside at some point as well. Max Gruder, LB, Pittsburgh: A couple of scouts sitting around me had good things to say about Gruder today and they were talking about the positive experience they had watching him when they traveled to Pitt’s campus on a scouting trip this year. That doesn’t surprise me one bit because while Gruder isn’t a physical freak he is very fundamentally sound. He’s easy to like for that reason, so while he may not have much starter upside I do have a draftable grade on him because I think he would be very valuable on special teams and as a reserve. Josh Norman, CB, Coastal Carolina: Everyone was talking about Norman today as a result of his two interceptions. Not too many people mentioned that on the play he collected his 2nd interception on he made significant contact with the receiver as he was running his route and enabled him to recover and track the deep ball and come down with the interception. Not exactly perfect coverage, but he did display quality ball skills all practice thanks to his two interceptions plus a couple of nice pass deflections. He definitely impressed me as I had never seen him before but he consistently stuck out in one on one drills. I’ll definitely be keeping my eye on him this week. Micah Pellerin, CB, Hampton: Pellerin impressed me today as well though I didn’t see him very much. He definitely seemed to give B.J. Cunningham fits when he matched up against him, but he showed quality athleticism, closing speed and seemed to be a pretty fluid athlete. Combine that with measuring in at just over 6’0” this morning and he had a good day. R.J. Blanton, CB, Notre Dame: Blanton didn’t stick out to me too much today but he did seem to have a pretty good feel in coverage. This isn’t a great barometer, but on one play he was covering LaRon Byrd and he almost seemed to run Byrd’s route better than he did. That probably has something to do with Byrd having no suddenness as a route runner, but it was still impressive to see from Blanton. Charles Brown, CB, North Carolina: As I pointed out in my preview, Brown’s upside is as a zone corner and he showed that today as he closed well on plays in front of him. He turns and runs pretty well though he does have a bit of tightness in his hips. I’m not very high on him and I don’t think he has a lot to offer as a man coverage corner, but he has a chance to prove me wrong this week. Justin Bethel, CB, Presbyterian: Bethel was a bit of a confusing prospect for me today because he showed some ability to close on plays in front of him but his backpedal needs serious work. There were times he wasn’t even pedaling in 1 on 1’s which was a bit surprising to see. He’s a small school guy who probably got away with some sloppy technique against a lower level of competition, but that won’t work very well here. If he tries that against the talented group of West receivers on Saturday he will get abused. Matt Daniels, SS, Duke: Daniels has some ability but he didn’t look very good in man coverage today. He got burned a couple times and one time he got burned so bad that when he reached out to try to grab and hold the receiver as he ran his route he couldn’t even reach the guy. I expect that he will have better days than he did today, but today wasn’t a great day for him. Jerrell Young, S, South Florida: I mentioned him a few times in earlier notes I had on offensive players and that means there weren’t a lot of positive plays that I saw from Young today. He got caught flat-footed in coverage a couple times and got burned as a result of it. Christian Thompson, S, South Carolina State: I didn’t take a lot of notes on Thompson but he didn’t measure in very well this morning. He was just over 6’0”, 213 pounds and only had 31 5/8 inch arms and small 8 ¼ inch hands. He also looked leggy in his backpedal and didn’t click and close very effectively when I was watching him early on in drills. Overall this group of safeties did not impress me, the corners looked much better today. -I really like B.J. Coleman. He missed some time due to injury this year which I thought might hurt him, but I was very happy to see him get an invite to the East-West Shrine Game. His game reminds me a bit of Nathan Enderle from last year, and there are some parallels between them that are pretty interesting (both started Senior season vs Nebraska, strong armed QB’s without much talent around them, both invited to East-West Shrine Game. I could go on, but I won’t.) Regardless, Coleman is a quality prospect in his own right and I think he has a chance to go in the first four rounds. This week will be big for him but if he is healthy he should have impressive ball velocity, good accuracy and pretty good pocket presence. I look forward to taking notes on him all week. -I left his name as “Johnny” since that was how it was listed on the official roster and it cracked me up. Brantley is a guy that is starting to get some buzz as a sleeper and I understand why. He’s got experience playing in the SEC and he’s got a very strong arm. He did not have much success in his last two seasons as a starter in Florida but playing for two entirely different coaching staffs with very different offensive philosophies certainly didn’t help. I’m sure he appreciated not being taken out on 1st and 2nd down and thrust into a 3rd and long this year like he was in Urban Meyer’s last season at Florida (his first as a starter). He still didn’t do much passing this year in his first and only year under Charlie Weiss (who is now the head man at Kansas) but he did throw for 2,044 yards while completing 60% of his passes for an 8.5 yard average per attempt. He only threw 11 touchdowns as compared to 7 interceptions, but that was an improvement over his very unimpressive 9 touchdown, 10 interception stat line as a junior. Plenty of people have soured on him and don’t give him much of a chance at the NFL, but guys with his size and arm strength are always in demand. He’s been through a lot at Florida, but if he can have a solid week at the Shrine Game it could ensure him a chance as a late round draft pick or as an undrafted free agent come April. -Davis is the quarterback with the least upside of the quarterbacks on the East Roster. His size and arm strength are both average for the NFL and if there are any windy days down in St. Petersburg I think that will become very apparent. He’s the most athletic of the three quarterbacks and he does have an abundance of starting experience but I don’t think he has enough upside to warrant much consideration before the 7th round or as a priority free agent in April. He’s solid in a number of areas but spectacular in none, though he is supposed to have pretty good intangibles and football IQ. I don’t expect to see anything different than what I did at Southern Mississippi, but he might have the biggest adjustment to taking snaps from under center since Brantley had a chance to do that a bit with Weiss at Florida this year and Coleman ran an offense with pro-style looks in it. He’s definitely #3 on the depth chart for me, but it will be interesting to see him up close. -Poole isn’t a freak athlete and he isn’t a burner, but he is a compact, well built running back. I like running backs that have compact, well filled out frames and Poole fits that bill. He runs hard, he’s strong, he has a good natural pad level because of his size, and he has shown the ability to run through arm tackles and gain yardage after contact. He’s my #1 RB at the East-West Shrine Game and I’m excited to see him in person. He’s an underrated guy that may not go very high on draft day but will be ready to contribute immediately and surprise people in training camp. -I’m not a big fan of Meggett. He’s never really been the feature back until this season and his lack of production gives me pause when trying to evaluate him. He’s got the compact frame that I like in a running back, but he doesn’t break as many tackles and gain as many yards after contact as you would think given his size and strength. He’s supposed to be a big weight room guy who works very hard and was a team captain, but weight room strength doesn’t always translate to the football field and I’m worried that it doesn’t in his case. I question his balance a bit and that concerns me since I’m not sold on his vision and he doesn’t have the burst and speed to rip off big chunks of yardage. He’s a complete back though because he can run the ball, catch it out of the backfield and offer effort as a pass blocker. He needs work in all areas in my opinion, but there is ability to mold in all facets. He’s got some upside because he’s never really gotten a chance to be a feature back, but I wonder if he will ever reach it. -Graham definitely doesn’t look like he weighs 180 pounds to me so I will be very interested to see what he weighs in at. My estimation would be he’s actually about 5’10”, 170 pounds but that is just my opinion. Regardless of his official measurements there is no denying his speed and explosiveness. He put all of his ability on display in NC State’s bowl game against Louisville as he put on a show with 7 receptions for 116 yards and 2 touchdowns in that game. He finished the season with 46 receptions, 757 yards and 7 TD’s receiving this year which nearly exceeded all of his production as a receiver from his previous three seasons on the Wolfpack. In his first three years he totaled 52 career receptions, 673 receiving yards and 5 touchdowns. He was only 6 receptions short of doubling his career receptions, yards and touchdowns total as a receiver as a senior. On top of that, Graham also has 630 career punt return yards with one touchdown and 3,157 career kick return yards and two more touchdowns. He had well over 5,000 total yards as a member of the Wolfpack and I think that his value as a receiver and a kick returner will be on full display during the East-West Shrine Game. I definitely think Graham will be a riser during the week and I really like his NFL upside. He’s my #1 WR on the East going into the week, so it will be very fun to see him play in person. -I’m not a big Cunningham fan personally but there’s no denying the production he has amassed while at Michigan State. He has never had a season with under 500 receiving yards in his four years as a Spartan and in the past two years he has totaled 129 receptions, 1,917 yards and 21 touchdowns receiving. The list of more impressive stat lines over the last two seasons is pretty short and it’s headlined by a potential top five pick in Justin Blackmon. As a senior Cunningham had by far his best season with 79 receptions, 1,306 yards and 12 touchdowns. As a junior he was pretty inconsistent and dropped too many passes for my liking, but he seemed to improve that a bit as a senior. His hands are still a concern for me and I will be paying close attention to both how well he catches the ball this week and HOW he catches the ball. Namely, is he snagging passes outside of his frame, therefore displaying quality range, or is he body catching and letting passes outside of his frame bounce off his hands. -Coale is a guy I have been paying attention to for the last two years because I’ve watched a significant amount of Virginia Tech over that time and while he may not be the #1 receiver on their depth chart there isn’t a lot of doubt in my mind that he had the best hands on the team. I was and still am high on Jarrett Boykin, a fellow senior who will be vying to be drafted, but Coale is a quality player in his own right. I’m not sure I’ve ever seen him drop a routine pass and he adjusts very well to the ball when it’s in the air and has much better timed speed than I expected him to have. He’s got serious sleeper potential and I think he could be a guy that catches a lot of people’s eyes during the week of practices at the Shrine Game because he will almost certainly make a great catch that sticks in people’s minds. He is all effort all the time and while he probably won’t go very high in the draft I would be shocked if he didn’t end up making a NFL roster and working his way into a contributing role. -Lewis is a solidly built WR that has more speed than I expected him to have. I haven’t seen him enough to quantify exactly how good his hands are, but he strikes me as a mid-late round prospect that should be able to stick on a NFL roster. He missed three or four games this season which hurt his statistics as he totaled 60 receptions, 600 yards and 8 touchdowns on the year. That’s a solid total, but it pales in comparison to his junior season (his first with East Carolina) when he burst onto the scene with 89 receptions, 1,116 yards and 14 touchdowns. I haven’t done enough tape study to figure out if the drop-off is due only to his missed playing time or if he was not the same player he was last year when he had Dwayne Harris playing with him. Hopefully he is 100% ready to go and he can impress in this game because I think he has enough value to get drafted in the 5th or 6th round range. -Pennsylvania: Mayo is a guy who is getting some love as a small-school sleeper. I haven’t seen any game tape of him yet, but I have heard good things. I’m very excited to see him in person and I think he has a chance to make himself some money if he plays well. I have a feeling a lot of people know of him, but don’t have a great feel for his game yet. -I’m not sure why Byrd is on this roster to be honest. I thought he had some upside a couple of years ago, but he has continually disappointed me and anyone else who expected him to be productive. He was effectively buried on Miami’s depth chart and Jacory Harris’ ineptitude at quarterback didn’t help things, but I am pretty skeptical of Byrd’s talents at this point. He had more touchdowns as a freshman (4) than he had the next three years of his career (3, one each season). On top of that, he capped off his career as a Hurricane with a monster season totaling 11 receptions, 125 yards and 1 touchdown. Obviously I was being sarcastic saying he had a monster season since there are players playing in this game that have almost as many touchdown receptions this year as he had overall receptions. Byrd has the size and athleticism combination you would like to have in a receiver, but I’m not sold on his hands and his lack of almost any progression over his entire career at Miami makes me question whether he will ever reach the potential he seemed to flash as a freshman three years ago. -Ford’s 9 receptions, 88 yards and 1 touchdown may not seem that impressive, but he nearly matched LaRon Byrd’s production, so he must be good! I personally don’t think Ford was the best tight end on Miami’s roster, I think Blake Ayles (a USC transfer) was. Unfortunately, Ayles went down with an injury at the beginning of the season and didn’t accrue any stats this year. Hopefully he will be healthy soon, but in the mean-time I can’t say I think Ford has much of a chance of being drafted. Ayles would have been the starter had it not been for his injury, so I don’t have very high expectations for Ford this week. Frankly, I think there are other more deserving tight ends that could have been in this game. Ladarius Green, Nick Provo, Aron White and James Hanna are all guys I like at this position that won’t be at this game. -I wanted to give you guys a synopsis of what I expect from the offensive tackles for this roster but I haven’t seen any of them enough to give you what I consider a quality breakdown of their abilities. I’ve always enjoyed watching offensive line play though, so rest assured I will keep a close eye on them throughout the week. Dennis, however, I have seen. I’ll admit before the first time I saw him I glanced at his 40 yard dash time and wondered how athletic he could be, but that’s just another reason not to put stock in the 40 yard dash times of offensive linemen. Dennis moves much better than his 40 yard dash time would seem to indicate, especially for such a large man. I think Dennis could be a real riser this week, especially if his line coach can coach him up a bit and help him with his technique. Dennis has some tools you look for in an offensive lineman and while I don’t think he will go before round 4 or 5 I do think he has starter potential in the future. He’s going to take a year or two of coaching up and developing, but if he takes coaching well and has a good work ethic I think you could see him starting in a few years. -Saulsberry is kind of under the radar right now since there are some talented interior offensive linemen in this class. The center class is headlined by a first round center in Peter Konz, but it has some draftable talent and Saulsberry is in that group. I don’t have a great feel for his game yet, but he is being mentioned as a sleeper and I am excited to see how he looks this next week. He’s an under the radar guy, but he might be a riser this week. -Conrath has played DE at Virginia for a long time but a few people have started to project him inside. I disagree with that because I think he has a pretty ideal frame to bulk up and play defensive end in a 3-4 defense. He might not be big enough yet, but at 6’7” he has the frame you love to see in 3-4 defensive ends. It will be interesting to see where he plays this week since I don’t think he is a great fit as a left end in a 4-3 defensive scheme but I don’t think he fits well as a defensive tackle in that scheme either. As a result he might be a little out of position this week depending on where he lines up, but as a mid-late round guy I like him. -Miller is a solid but not spectacular defensive end for West Virginia. Playing opposite Bruce Irvin meant he didn’t attract a lot of attention and that helped him rack up 57 total tackles (31 solo), 11.0 TFL, 6.0 sacks, 2 forced fumbles and 2 pass break-ups this season. I don’t think he has a lot of edge speed and I don’t think he’s fantastic against the run either, so I question how much upside he has at defensive end. I think his best case scenario is being a rotational defensive end in the NFL, but I am looking forward to seeing how he looks in person getting off the ball, how much bend he has and how well he uses his hands among other things. -Wilber is a guy that I was high on coming into the season but he didn’t have the break-out season that I expected him to have. Many people think he will have to move to outside linebacker in a 3-4 defense in the NFL and I tend to agree. He has a pretty skinny frame despite his 6’4” height so I don’t know how much weight he will be able to pack on. He’s listed at 240 pounds and I think he could get up to 250 or 255 pounds on a quality weight training program but even at that weight he is likely too light to be able to play at right end in the NFL. This week will be important for him because he may get a chance to drop into coverage at some point. I haven’t seen him do that much at Wake Forest but I haven’t completed my film study on him yet. Regardless, he’s an athletic guy with upside in my opinion. This year he had 69 total tackles (47 solo), 10.5 TFL, 3.5 sacks, 2 forced fumbles, 1 pass deflection and he also blocked a kick. In the past two years he has 25 tackles for loss, 9.5 sacks, 5 forced fumbles, 6 pass break-ups and 2 blocked kicks. The production and athletic ability is there, so I’m hoping he can have a big week and help demonstrate the ability that led me to put him on my list of potential break-out players at the beginning of the season. -Jean-Baptiste definitely catches your eye when he’s on the field because of his sheer size. The weigh-in will be important for him because if he comes in looking flabby and out of shape it will raise some concern from talent evaluators. However, his combination of size and athleticism is pretty impressive. I just don’t think he is as good as he could be yet given his natural size and athleticism. He was a complete non-factor in the Anti-Defense Bowl between Baylor and Washington a couple weeks ago and that’s concerning to me. I am interested to see how he plays this week but it seems that defensive tackles, perhaps more than any other position (at least, off the top of my head) really know how to turn it on when they are playing for a pay-check. Albert Haynesworth is the best example I can think of to support this claim, and if Jean-Baptiste plays great this week in stark contrast to his performance against Washington it will help his stock but make teams wonder where this effort level and ability was when everyone watching that game was begging for a quality defensive performance. -Regis was definitely overshadowed at Miami because that defensive line was bursting with talent. They didn’t live up to it this year unfortunately, but a defensive line with Olivier Vernon, Marcus Forston and Adewale Ojomo had a lot of potential. That left Regis in a reserve role before Forston’s injury, and even though he has had playing time throughout his career at Miami he has never had more than 8.0 TFL and 3.0 sacks, which he posted as a junior last year. I’m not sure he has much upside beyond a defensive tackle that can contribute to a 4-3 rotation, but it will be interesting to see how he looks this week. -Lindsey flashed onto the scene as a junior when he posted an impressive 18.0 TFL, 10.0 sacks and 3 fumbles forced after Greg Romeus went down with another injury. This year he was without Romeus and Jabaal Sheard but he still posted 55 total tackles (31 solo), 11.0 TFL, 8.5 sacks, 2 forced fumbles and 1 pass deflection. Lindsey doesn’t project to a defensive end position very well but I think he will be able to transition effectively to the outside linebacker spot in a 3-4 defense. He’s an athletic guy and has shown that he’s capable of producing at Pittsburgh even though he may not have been used properly. -Gruder isn’t a freak athlete by any means and he probably doesn’t project to be a NFL starter now or in the future, but I think he’s going to be a great special teams player and a quality reserve in the NFL. He’s a reliable tackler and the Pittsburgh coaching staff admitted that they continued to try to take him out of the lineup but he was so fundamentally sound that he always found his way back onto the field. It will be interesting to see how he looks this week, but I wouldn’t expect him to be dominant in any one phase of the game. He seems like a guy who is solid in all facets but spectacular in none, and while that may help get him drafted I don’t think it gives him a great shot to start in the NFL. -Brown is another undersized cornerback from North Carolina that I think is primarily a zone corner personally. I always thought that his former teammate Kendric Burney was the better player and Burney went undrafted. That’s not to say that Brown will also go undrafted, but it speaks to where his draft stock is likely to end up barring a spectacular performance this week. I don’t think Brown has the size and speed to stick with receivers in man coverage very effectively, but North Carolina likes to run zone coverage and Brown should offer value in that phase of the game. I am interested to see him try to press corners during the week and I want to see how he does in man to man, though I anticipate him having some issues especially against taller, more physical receivers. -Daniels is a quality sleeper prospect at the safety position. He isn’t a freak athlete but based on what I have read he has great intangibles, a high football IQ and an impressive work ethic. Those kinds of players are the ones you like to bet on when it comes to the NFL because they’ll get the most out of their ability even if they don’t project to be perennial pro-bowl players. Daniels has always impressed me as a tackler when I’ve watched him play over the last two years but I have never seen him much in coverage. This year he produced 126 tackles (65 solo), 4.0 TFL, 14 pass deflections, 2 interceptions and 1 forced fumble. I am interested to see how he looks in coverage this week but I expect him to be one of the more reliable tacklers at the East practices all week. -Walsh is a confusing player to me, but then again kickers in general are pretty confusing to me. During his sophomore and junior seasons he missed a combined five field goals, a terrific stat line for any kicker. In his first three years he missed 13 field goals, eight of which occurred when he was kicking as a freshman. Then this season he inexplicably missed 14 field goals, more than he had missed his entire career up until this point! I haven’t done my film study of Georgia yet but I definitely will and I am very interested to see what situations he missed kicks in. I’m not sure what to expect from him this week, but hopefully he gets his mojo back and starts making kicks more consistently because he’s got a helluva leg. He had 19 touchbacks this year and that was kicking from the 30. In the NFL he will be able to kick the ball into the end zone very consistently and provide a lot of touchbacks for his special teams unit. That gives him value, but it won’t mean much if he can’t make field goals when asked to. This is obviously just a fraction of the talent at the East-West Shrine Game, but these are the players I am more familiar with. I’ll have notes on most every player by the end of the week and they will be posted here every day after practice, so check in every day for your East-West Shrine Game fix! Kirk Cousins and the Michigan State Spartans were the ones celebrating at the end of this thrilling contest between two Big-10 championship contenders. When I saw the schedule for this 2011 season I pointed this game out to every one of my friends who likes the Badgers and said “This is going to be a critical game not only for the Badgers’ season, but for the entire Big-10 conference.” After Michigan State lost to Notre Dame it didn’t seem like my prediction would come true, but boy did it ever prove to be correct. This game had immense ramifications not only for undefeated Wisconsin and one loss Michigan State, but for the rest of the teams in each division of the conference that are trying to catch both teams for a shot at the Big-10 title game. I will readily admit that I missed the entire first half of this game. I was on my way back from an away game that my college’s football team lost (63-41, it was quite a shoot-out) and started watching instantly once I got back. I got to see Kirk Cousins and Le’Evon Bell drive down the field for a huge touchdown to put Michigan State up 31-17. I thought Wisconsin was toast at that point, especially because of how much trouble they were having slowing down Michigan State’s running game, plus they were struggling to move the ball effectively on offense. But Wisconsin’s defense made three great stops in a row and kept Wisconsin in the game, and Russell Wilson proved that he is worthy of a lot of the praise that he receives nationally by leading two touchdown drives in the last 10 minutes of the 4th quarter to tie the game at 31. On the game tying drive he was 4/4 with a huge 3rd down conversion, a fantastic throw on an extended play to Nick Toon, and then bought more time outside of the pocket, drew a defender in as he rolled to the sideline and dropped the ball off right over him to Montee Ball for an easy score. Some of my close friends will remember me questioning how good of a coach Bret Bielema really is when we were freshmen and sophomores. Calling a timeout with 30 seconds left instead of playing for overtime didn't really change my mind. This is where things got crazy. Michigan State got the ball back and Cousins did not start strong. He checked down for three yards on his first pass, then short-armed a throw to the near sideline on a curl at the marker. 3rd and 7, and he threw a dart underneath to convert. Michigan State continued to try to move the ball, but couldn’t get significant chunks of yardage. With 30 seconds left, they were content to let the clock run out and take the game to overtime. But to my disbelief Bret Bielema called his second timeout of the half and stopped the clock, foolishly hoping to get the ball back to Russell Wilson and his suddenly potent offense. But with the ball around the 40 yard line, even if the Badgers had stopped the Spartans at that point they would have punted it and at best the Badgers could have hoped for the ball on the 30 yard line with 15 seconds or possibly less remaining. Not much time even with a timeout and Russell Wilson’s strong arm. But Bilema decided to do it anyways, and Michigan State managed to convert and the game seemed to be slipping away from Wisconsin. But with 10 seconds left the Spartans found themselves outside of field goal range with only one timeout left. They snapped the ball and Cousins started scanning the field but the clock never started. In fact, the clock didn’t start running until after the play had nearly concluded and it continued to run after the play was over (all the way down to four seconds). Suffice it to say, in all the years I have been watching football I have never seen anything quite like that, and no one in the stadium seemed to notice nor did they seem to care. You’d think Michigan State would be interested in seeing if more time should have been allotted for that final play, but apparently not. Ohio State and Michigan were both watching this game intently. Ohio State started slow, but is gaining momentum. 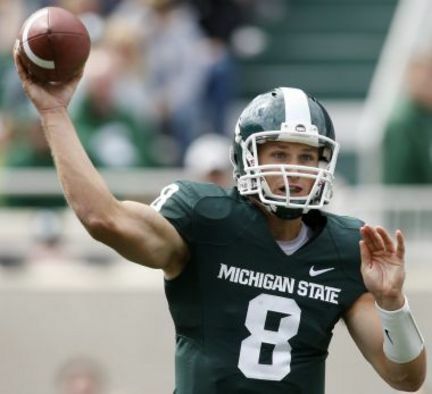 Michigan has had a terrific start to the year, but needs to catch Michigan State. Then the craziest thing of all happened. After the timeout, Michigan State lined up with trips on the right side of the formation, Cousins rolled out to his right side to buy time and lobbed up a hail mary. Jared Abbrederis and a number of other players were down waiting for the ball near the end zone and Abbrederis jumped to try to catch it or knock it down but he didn’t time it right. The ball bounced off of a Michigan State receiver in the end zone and Keith Nichol, a former quarterback who transitioned to wide receiver after losing the starting job to Cousins, managed to catch it on the one yard line. He then fought tooth and nail to BARELY claw the ball over the goal line for a touchdown. Initially it was ruled that he was down on the one yard line, but when looking at the replays of the play it was clear that the ball crossed the plane of the end zone (even if it barely crossed it). So, with that, the Spartans beat the Badgers for the second year in a row during a critical portion of the season. This doesn’t dramatically hurt the Badgers’ bid to ultimately become Big-10 champions because Michigan State and Wisconsin are in separate divisions, but it does all but dash Wisconsin’s chances at the BCS National Championship. Ohio State is looming after coming off of a quality win over then-ranked Illinois. Wisconsin travels to Columbus next, and it is imperative that they win this game to keep Ohio State from roaring back in the second half of the season. Michigan State maintained their lead in the opposite division ahead of Michigan, and if they win out they will be in the Big-10 Championship Game. 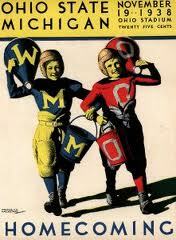 Wisconsin is in the same boat, and I for one hope both win out so that we can see a rematch of this game. It probably won’t be as exciting or as unpredictable as this one was, but it would likely be a great game. Logan Thomas will be filling Tyrod Taylor's shoes at quarterback, and I have high expectations for him. He has a ton of upside. 11. Virginia Tech- A lot of people might be surprised to see VT this high, but even though they don’t often come away victorious against the best teams they are incredibly consistent and they are definitely a program that finds a way to reload versus rebuild, and that is exactly what they will be doing in lieu of losing Tyrod Taylor, Ryan Williams, Darren Evans and Rashad Carmichael to the NFL draft. David Wilson is ready to be the man at RB now that Williams and Evans have departed, and the word explosive might be an understatement for him. He compiled 619 rushing yards (5 TD’s), 234 receiving yards (4 TD’s) and 584 kickoff return yards (2 TD’s) on only 150 touches! That’s over 1,300 total yards on exactly 150 touches, which is pretty impressive especially in a rotational role. He will be the man now though, and Logan Thomas looked very impressive in spring ball from what I heard, and I am excited to watch him play. He looked good to me when I saw him sling the ball a couple times last year, but this will be his first season as a starter. At a listed height and weight of 6’6”, 242 pounds plus mobility he is going to be one to watch I’m sure. VT always has a fast defense and they have a few guys ready to emerge as quality pass rushers this year. J.R. Collins (a sophomore in 2011) had 5 sacks last year and apparently looked very good this spring, and I expect him to emerge as the best pass rusher on the team. Additionally, Chris Drager has shown some ability but I’m not sure whether or not he will start as a senior. And finally, James Gayle (a sophomore in 2011) had 4 sacks in limited playing time last year and should get more snaps as a part of VT’s rotation. VT also has a talented secondary, led by Jayron Hosley, a cornerback with 1st round NFL draft potential. VT is a team to watch this year, as they should contend with Florida State, Miami and hopefully North Carolina to be the top dog in the ACC. 12. Miami- I have been saying for months that I think Miami is going to be very tough this year and now it’s time for me to put my money where my mouth is. They just have so much talent! It all comes down to quarterback though. I realize this might feel high, especially considering my very low opinion of Jacory Harris, but I can’t imagine that Al Golden will leave him in there too long unless he plays well. So either he plays bad for a few games, gets yanked, and Morris steps in or Harris recovers his sophomore year form and Miami immediately becomes a contender for the ACC title. But outside of QB they have a load of talent. Headlining that group are guys like Lamar Miller, Travis Benjamin, LaRon Byrd, Blake Ayles (a transfer from USC), Olivier Vernon, Marcus Forston, Adewale Ojomo, Sam Spence, Vaughn Telemaque and Ray Ray Armstrong, among others. Their defensive line is going to be incredibly scary if they can all mesh together, because I had three or four of their defensive linemen on my list of potential breakout players this year. Vernon, Forston and Ojomo alone should guarantee a good run defense and a FIERCE pass rush, so I am very excited to see how this team does this year. They have a ton of potential, I just hope they live up to it. 13. Michigan State- Michigan State is coming off of an embarrassing loss to the Crimson Tide in their bowl game and I think they will be hungry after barely missing out on the Big-10 Championship (even though they beat the eventual winner, Wisconsin, handing them their only loss before they lost to TCU in the Rose Bowl). They return a ton of talent such as Kirk Cousins at quarterback, and three quality running backs led by Edwin Baker with Le’Veon Bell and Larry Caper providing quality touches when Baker is rotated out. They also have a game breaker in Keshawn Martin, a dangerous slot receiver and kick return man, plus B.J. Cunningham is returning. That means they will have two experienced receivers for Cousins to throw to. If their offensive line holds up they should have another very balanced attack that runs the ball effectively which opens up the play action pass, which makes them very tough to stop. On defense they will have a lot of talent up front as they started three sophomores and a freshman last year (headlined by Jerel Worthy and Tyler Hoover), and they have a huge sophomore William Gholston who is ready to step up for some playing time as well. They all have a lot of experience up front and they are young, and I think they will have no problem stuffing the run like they did last year and they should get after the passer as well. Their DL is the strength of their defensive unit, and it should make things easier for their LB’s (I believe they lost all three of their starting LB’s) and their defensive backs. Michigan State is definitely one of my favorites to win the Big-10, right up there with Wisconsin and Nebraska. 14. Nebraska- Nebraska has officially joined the Big-10 (which now has 12 teams) after leaving the Big-12 (which now has 11 teams… I think. Sometimes I can’t keep up). However, their playing style meshes perfectly with the Big-10 as they play great defense, they are physical and they love to run the ball. They are immediately contenders for the Big-10 title, but they aren’t as familiar with the conference as other teams are, so it’s hard for me to anoint them the front-runners for the conference title over teams like Wisconsin and Michigan State, who are both returning a lot of significant talent. Nebraska will be dangerous though, even without Roy Helu and Niles Paul on offense. They also have a good deal of talent on defense, headlined by Jared Crick, Lavonte David and Alfonso Dennard. They will be a fun team to watch this year, especially if Taylor Martinez can figure out how to throw the ball accurately. Kellen Moore has one last chance to lead Boise State to a National Title or elite bowl game, but it won't be as easy as in past years. 15. 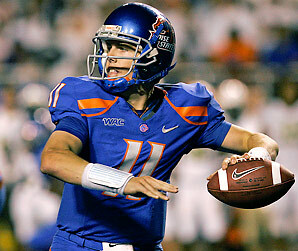 Boise State- I have Boise State lower then some people do, but I have my reasons. First, they start out their season with a tough game against Georgia. Georgia may not be a powerhouse, but they are consistently competitive and even without a lot of RB help they still have a good quarterback in Aaron Murray, the best TE in the country in Orson Charles, and like all good SEC teams do they recruit well and have some nice incoming talent. With Boise State losing some of their best weapons on offense (Titus Young and Austin Pettis in particular) along with their offensive coordinator (who went to Texas) it isn’t unrealistic to expect them to be in a dog fight (pun intended) with Georgia in week one. But major props to Boise State for scheduling a legitimate out of conference opponent, because most teams don’t have the cojones to do that, especially teams from non-AQ conferences that are out of the title and elite bowl game race with just one loss. If they can get past Georgia, though, they have a shot to make it to the title game if they win out. But every year there is a scare or two, even for teams with as much experience as Boise, but Boise has the talent and they have done this enough times with Kellen Moore at the helm that I think they have a good shot at ending the season with one or no losses. I can’t wait to see the game against Georgia, I really have no idea what way that will go. Thanks for reading my third installment of the top 25! The top 10 will be unveiled over the next two days, so check in soon!